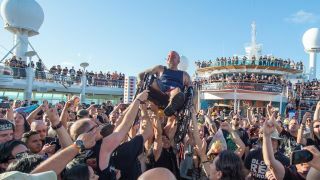 A staple part of the heavy metal calendar for eight years now, the latest edition of the 70,000 Tons Of Metal cruise set sail earlier this year, travelling from Fort Lauderdale, Florida to Labadee, Haiti and back. Carrying over 50 bands and a few thousand delirious metalheads, it was another week of absolute lunacy. Where else would you get Max Cavalera and that annoying mascot from Nekrogoblikon rubbing shoulders with dive-bombing hairy blokes in mankinis? Quite honestly, where else would you want that? We were there, and we've put together a gallery of some of the week's most brilliant moments. Head to www.70000tons.com for info about next year's event.